Tonight I attended a church service that was a little different. 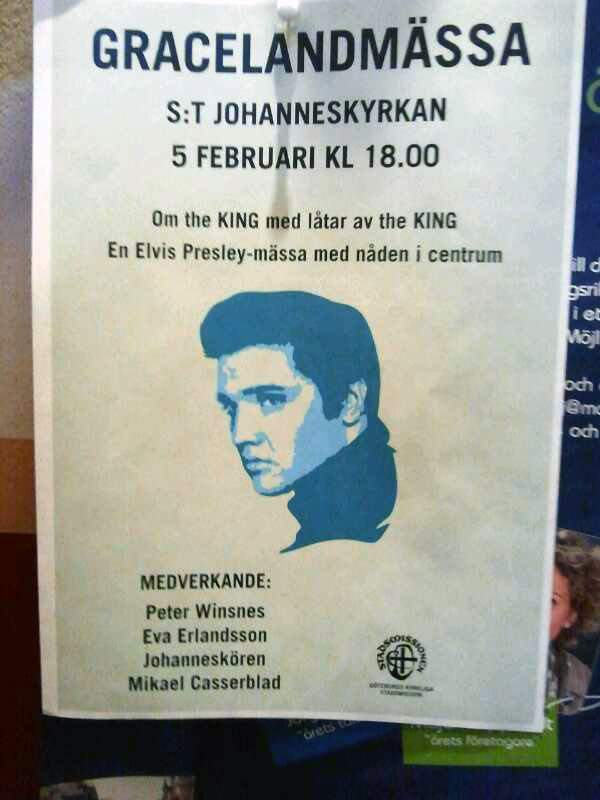 A couple of days ago my brother spotted a poster advertising a "Graceland service with songs by the King" in a church close to where I live (S:t Johanneskyrkan) and that sounded too good to miss. My brother joined me, as did my mother. Soon the church was full of people. A woman playing the bass explained that she and the man that sang and played the piano had been doing the "Graceland service" since 2006, visiting different churches and performing together with the local church choirs. Glancing at the program that was handed to me as I entered the church, I noticed that the songs weren't just religious ones. In fact, the whole service started with "Burning Love," followed by the more spiritual choice "Take My Hand, Precious Lord," where the audience was invited to join in the chorus. After a prayer it was time for "I Want to Be Free" and then the actual sermon took place. "Crying In The Chapel" felt appropriate after that, as did "In The Ghetto" when people could approach the altar and light a candle. "Just A Closer Walk With Thee" was a surprise (after all, it's a home recording). During the Holy Communion the choir and the band sang "Loving You" and "Can't Help Falling In Love," not exactly the choice of songs I would associate with that, but it worked well. As did "How Great Thou Art" where everyone in the church sang the chorus again. After "Love Me Tender" and benediction it was time for "Amazing Grace" and then the service closed with "An American Trilogy." 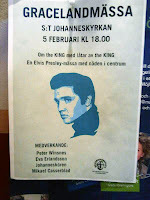 So ended the "Graceland service with songs by the King," and on my way home I thought once again how much Elvis' music means to so many people.